End of a dream - How the proposed luxury redevelopment of Harrogate's Crescent Gardens could have looked if it had gone ahead. 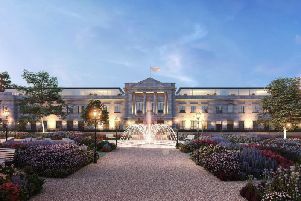 The collapse of the controversial £75 million Cresecent Gardens development in the heary of historic Harrogate has prompted calls for the who site to be used for community purposes. Harrogate Civic Society, long-term critics of the entire luxury project, said Harrogate developer Adam Thorpe's plans for luxury apartments had always been the wrong use of the ex-council headquarters. The society's chairman, Henry Pankhurst, said it was time owners Harrogate Borough Council put the community first. Mr Pankhurst said: "I have to say that many of the rumours and opinions surrounding the fanciful plans put forward for the multi-million pound apartments included disbelief that the project would ever happen. "Would it also be a fanciful thought to suggest that, if lack of funds from the sale has not been a block on building the new civic building, the old offices should be put at least in part to uses that are for the community of Harrogate? "After all, we were, at one time, promised that this would be so, by Adam Thorpe Properties. It would be good to have such a promise that could be kept." The announcement was first made yesterday, Monday, that the sale of Crescent Gardens had been cancelled.The former Harrogate Borough Council headquarters is to be put back on the market after a contract to sell the building to a developer was cancelled. The council took the decision to end a legal agreement after ATP (Crescent Gardens) Ltd failed to meet the deadline to submit a valid planning application for the site to turn it into luxury apartments - a development costed at £75 million. Mr Pankhurst said: "It has been surprising that the council continued to negotiate with Adam Thorpe Properties for so long. "The scheme for re-use of the Crescent Gardens offices changed considerably, literally , over the years. "We also saw the unexpected desire by the developer to take over the gardens by means of a lease. "All this negotiation, re-renegotiation and presumably demands that were made, plus, one would guess, much pre-application discussion and the excessive delay involved, has cost the council a lot of wasted time at our expense. "I believe we were to understand that the delay in actually obtaining money from the sale was not critical to the building of the new Civic Centre, which has been accomplished without it."